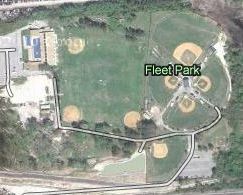 The Navy is shutting down Fleet Park and displacing 6 baseball fields used by the Fleet Park Little League with its 550 Little Leaguers. The Ocean View Little League lost their playing fields last year as the Navy is no longer allowing them to use Navy fields either. 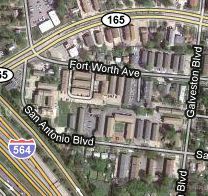 This was reported on by the Virginian-Pilot here.
. . . the high-density walkup apartments constructed in the Texas Streets section of Denby Park are, for the most part, not desirable housing. They have been built too close together, without appropriate provision of open space, and without amenities. The maze-like character of the resulting development, its proximity to highly-travelled Little Creek Road and to Interstate – 64 make it unfortunately suitable for drug dealing and for serving as a base for other criminal activity. The Norfolk police report that the situation in these buildings is getting worse. They recommend major change: the acquisition and demolition of these buildings, before the situation has even more adverse impacts on the surrounding neighborhoods. The City of Norfolk now has a need for new ballfields for our children. Let’s consider following the Comprehensive Plan, acquire and demolish the sub-standard housing in the Texas Streets, and build ballfields to replace those lost at Fleet Park. It would create a centralized place for Fleet Park and Ocean View Little Leagues to call home. Update: This is an idea that is being floated to gauge support. This has not been voted on or endorsed in any way by Wards Corner Now or any civic league. A new group, called Wards Corner now, formed in March with plans to supplant the partnership. Leaders of the new group said partnership leaders were too caustic in their criticism of the city. The friction boiled over during a fractious meeting of Wards Corner leaders and city officials months ago that attorney Martin Thomas Jr., a Wards Corner resident, said was simply too toxic. So Thomas joined civic league presidents Jim English and Jim McDonnell, realtor Louis Eisenberg, chiropractor Brad Robinson and others in leaving the partnership and forming Wards Corner Now. Thomas and others established a website, held monthly meetings and injected themselves into City Council politics in a big way. The group endorsed Andy Protogyrou in the Ward 1 council race. Protogyrou, a lawyer, defeated three opponents largely because of lopsided victories at Wards Corner area precincts. “Wards Corner needs an advocate,” Eisenberg said, much like W. Randy Wright has been an advocate for Ocean View. Wards Corner Now: Positive Change for Wards Corner. A man died after he was shot in the 7600 block of Lankford Ave., in the Wards Corner section of the city, on Tuesday night. Deonta Person, 20, was shot just after 9 p.m., police said Wednesday afternoon. Someone drove him to Bon Secours DePaul Medical Center, where he died a short time later, police said. A quick search of the Norfolk Circuit Court docket reveals a “Deonta Person” being indicted in 2009 for 4 counts of robbery and 2 counts of use of a firearm in the commission of a felony. REMEMBER: If you want to be a part of the conversation, Wards Corner Now is having it’s meeting this Saturday at 8:30am at the Fitness and Wellness Center. Where: Fitness and Wellness Center- Newport Ave.
Don’t forget that Wards Corner Now is meeting this Saturday, May 15, 2010, at 8:30am at the Fitness and Wellness Center. The Agenda includes an introduction of councilman elect, Andy Protogyrou, a representative from DePaul Medical Center, and a report on the crosswalk discussion with Norfolk’s traffic engineer, Guzin Akan. The Wards Corner Taskforce meeting is scheduled for Thursday at 8:30am at the Fitness and Wellness Center and we will be briefed on that as well. This meeting will be facilitated by Jim English. Congratulations to Andy Protogyrou on being elected to serve as the Ward 1 representative on City Council. We look forward to working with Andy on making Wards Corner a better place. You are currently browsing the Wards Corner Now - Wards Corner, Norfolk, Virginia blog archives for May, 2010.